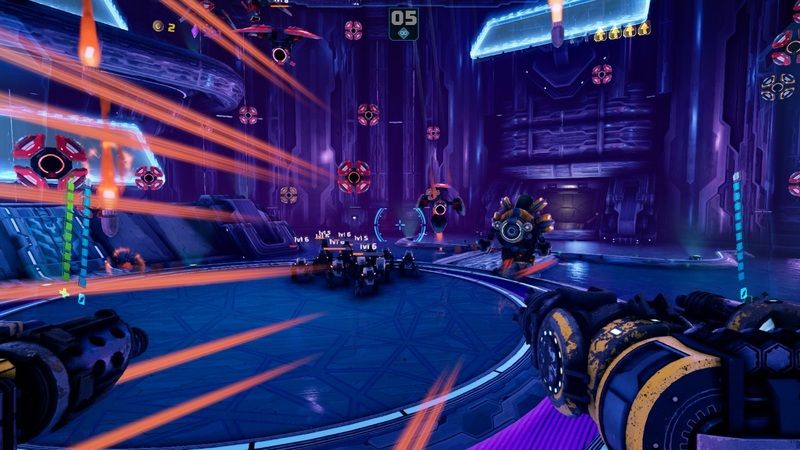 Mothergunship is about big, stupid, hand-crafted guns and exploding robots. Successor to Terrible Posture Games’ Tower of Guns and co-developed by Czech studio Grip Digital. It’s a roguelike-ish “Bullet Hell” FPS about raiding procedurally generated alien spaceships, hoarding gun-barrels and bolting them onto your remarkably agile power armour. A denser game than its predecessor, its complex systems are dressed up in breezy, comedic style, but its many turning gears grind against each other far too often. Alien robots have invaded, so you need to board their spaceships and shoot things until you find a big red self destruct button to make them stop. There’s some scattershot jokes from a small cast of chatty talking heads, and the occasional boss fight, but Mothergunship is mostly about its custom-built guns, with which you’ll shoot many turrets and flying robots. You bolt together connectors (purely structural), gun barrels (things wot go bang) and end-caps (stat modifiers) until you’ve found a balance of shootiness and energy consumption. When Mothergunship works it feels like playing a hybrid of Serious Sam and Descent in the world’s biggest, angriest bouncy castle. In the Neon ships especially – larger, purple-hued environments with bounce-pads everywhere – gravity feels more like a suggestion than a hard rule. In these larger rooms, swarms of oversized enemy bullets are clear and easy to weave through due to generous air control. Unfortunately, moments like these aren’t always assured, and too often hinge on multiple dice rolls landing in your favour. Mothergunship’s Achilles’ heel is its economy. While you can pick a few banked gun-parts to take on most missions (saved from successful runs, but lost if you die during the attempt), you’ll be buying most gun-bits in shops using coins dropped from enemies. The problem: coins are random drops, and shop appearances too. It’s not uncommon to go several fights with little to no cash payout, but a shop in every chamber. Similarly, you can hit a room with dozens of enemies and a 4x drop multiplier bonus, and find yourself rolling in cash but with no shop in sight. Mothergunship’s trailers feature comically outlandish, screen-filling guns. Sadly, weapons like this fall somewhere between impractical and implausible to construct in-game. You have separate recharging energy pools for left and right weapons, but their max capacity can only reasonably support four to five barrels at a stretch, and two to three in most cases. While you could theoretically construct a 12-barrelled flamethrower that encircles the entire screen, you’d only be able to fire it for half a second between lengthy recharge cycles. 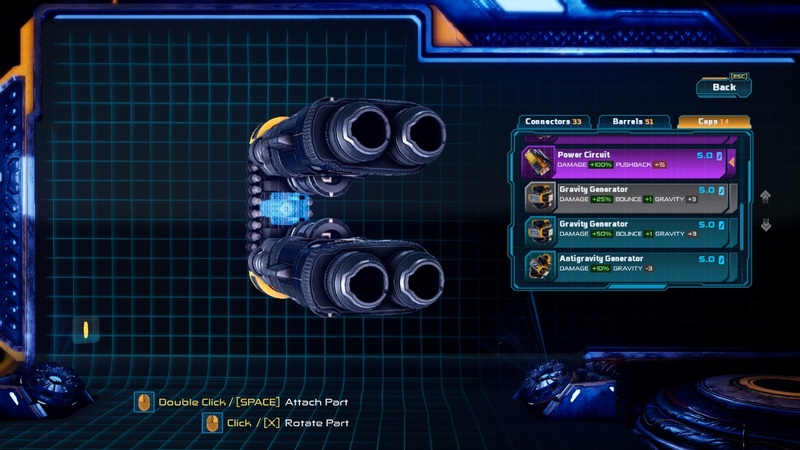 This, plus the stingy size and relative rarity of energy extension powerups leads to more conservative gun construction. I found the safest way to play was with a precision weapon in my left hand for distant targets, and something explosive in the right for swarms, both buffed with whatever damage-boosting caps I could find. This kind of play undermines Mothergunship’s better elements, but it’s practically a requirement if you ever want to break the enormous health bars of larger, palette-swapped ‘elite’ enemies. While you can often run past these more tedious foes, you’ll occasionally be locked into a room until everything is cleared. The only way out of there before you die of old age is maintaining damage output. It reduces Mothergunship to a game of min-maxing math, instead of gleeful improvisation and violent self-expression. These issues are mitigated somewhat in Endless mode, which unlocks a few missions into the main story. While you can still end up resource-starved, it’s easier to stomach thanks to the mode shuffling all environment types to keep things varied, and because you start out in a shop with no guns and a bit of money, removing the risk of losing favourite weapon parts. 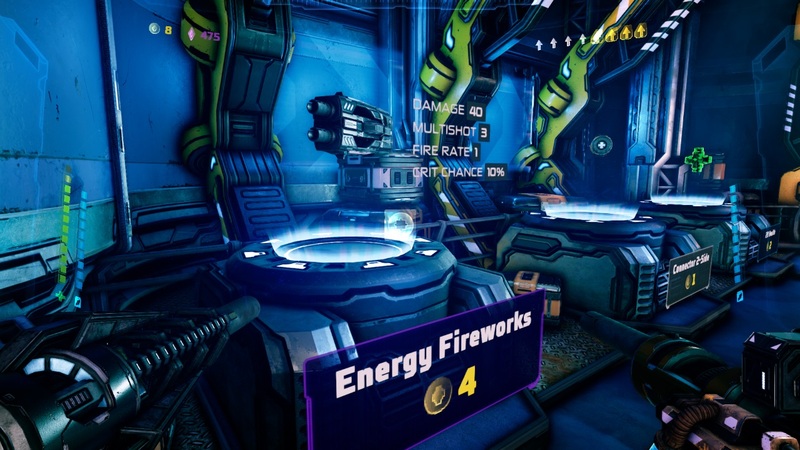 It’s a pity that Mothergunship’s regular missions feel almost engineered to exacerbate its issues, only worsening as you get deeper into the campaign and become more reliant on banked, rare and powerful gun parts. As it stands now, Mothergunship has a lot of likeable elements that sometimes mesh into an excellent whole, but just as often bump awkwardly against each other. There’s nothing fundamentally broken about the concept or individual parts, though. With a little luck and a following wind, I can see this one clicking together after some updates, but it’s not quite there yet. Those updates are definitely coming, too. 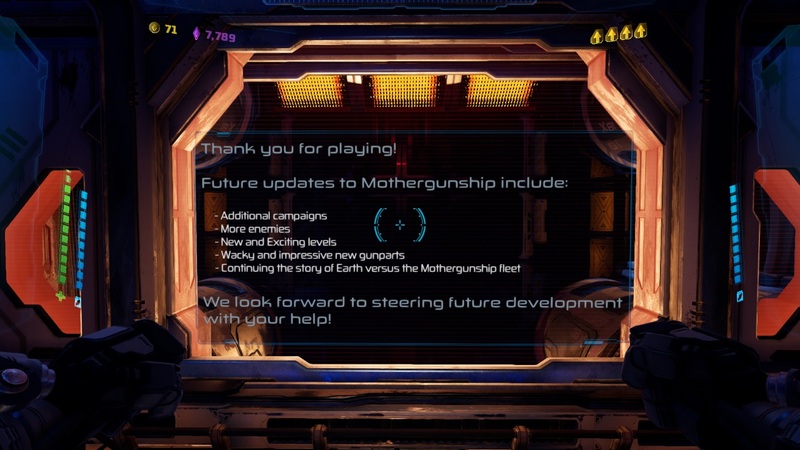 The current – and very open – end of the story is followed by a note (visible forevermore in your mission selection hub) that more is planned, including additional guns, environments, bosses and story. There’s even a co-op mode that wasn’t ready in time for launch that got delayed until August, as mentioned in this development blog post. Fingers crossed for the future. Mothergunship is out now on Windows for £19.99/$24.99/24.99€, via Steam and Humble. You can try out its gun-crafting system for yourself in this demo. Tagged with demo, Grip Digital, review, Terrible Posture Games, Mothergunship, Tower of Guns.